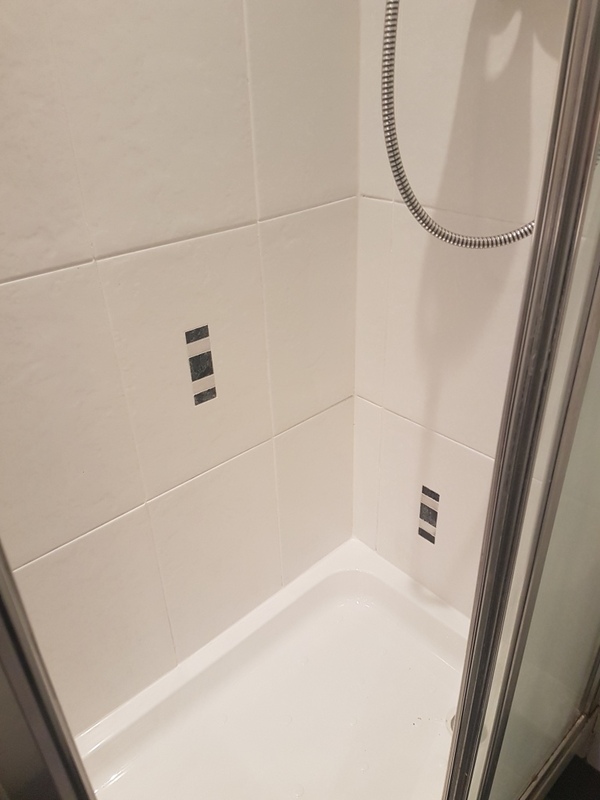 This article comes from a recently renovated house in the medieval cathedral city of Lichfield which is North of the new M6 Toll road. 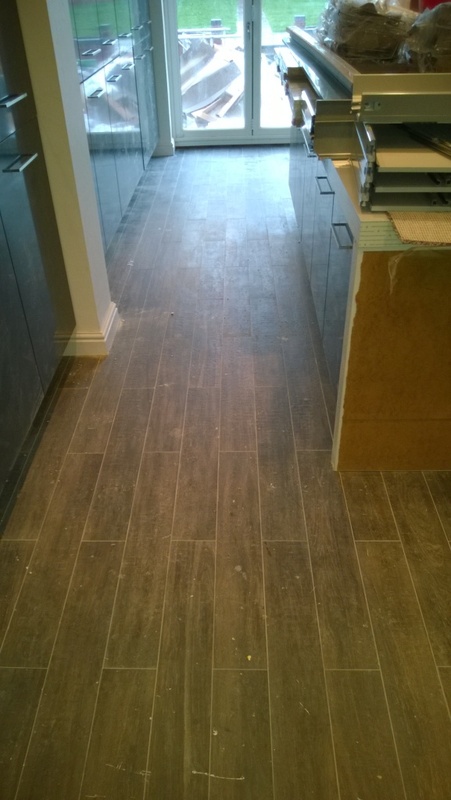 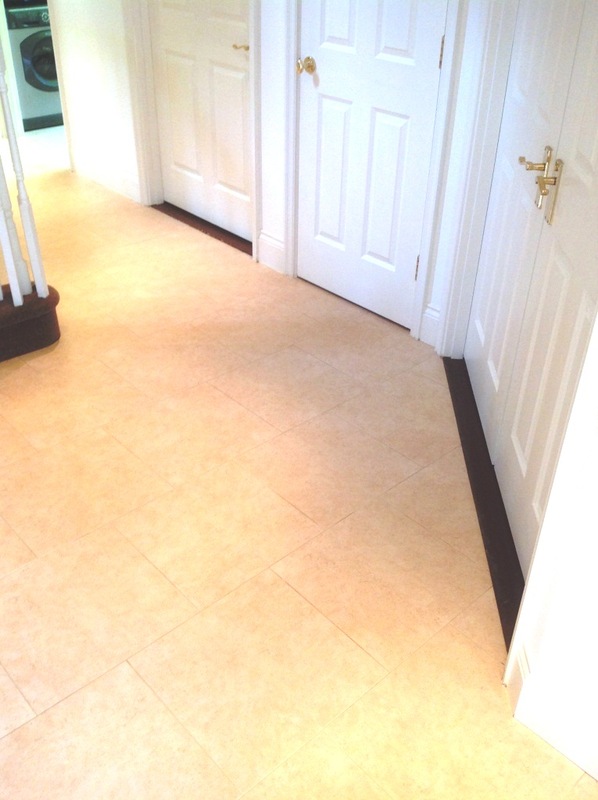 My customer had recently brought a house there and was refurbishing it from top to bottom, unfortunately however by the time the refurb was finished the new wood effect Porcelain tiled floor in the kitchen and hallway had become very dull & dirty. 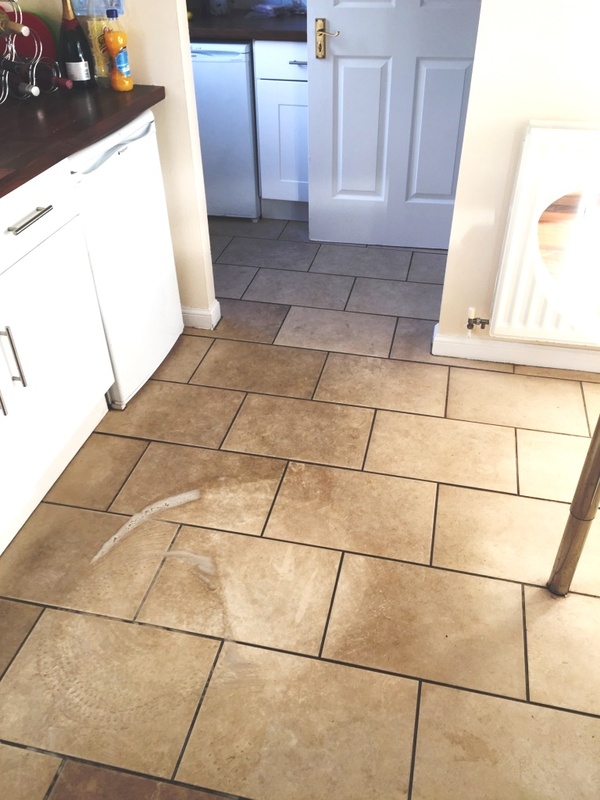 The tiled were basically dirty with plaster dust and I suspected grout smears to I decided the quickest and most effective method to clean them up would be to give the whole floor an acid wash with Tile Doctor Grout Clean-up. 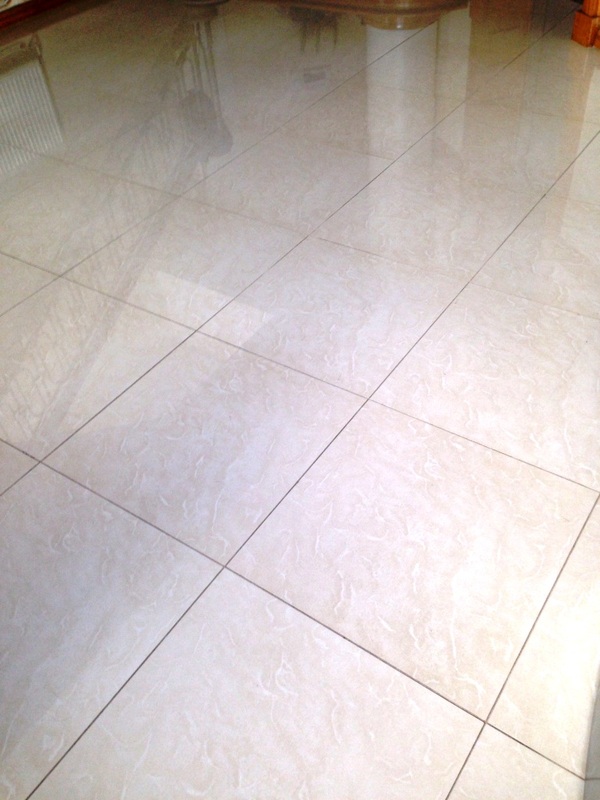 Tile Doctor Grout Clean–Up is specially designed for removing excess grout as well as dealing with mineral salt problems so working in sections I applied the product to the floor and left to soak for five minutes before scrubbing into the tiles and then rinsing it off with cold water which was then removed with a wet vacuum. 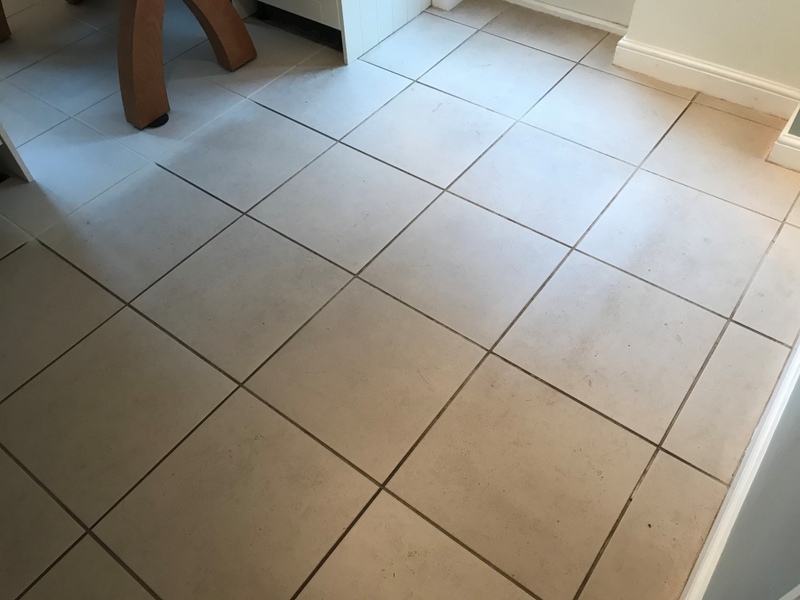 Some of the more stubborn areas had to be retreated and with a longer dwell time and more scrubbing but the process had the desired effect. 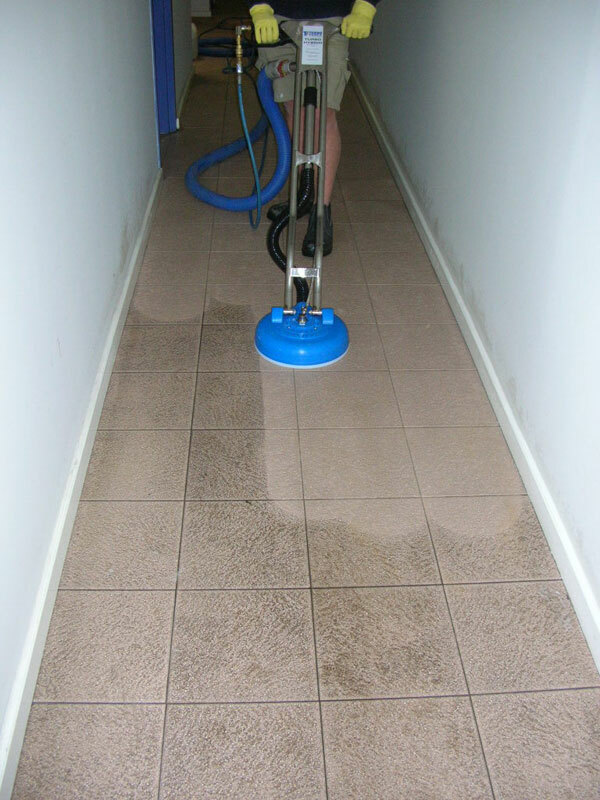 Once the whole floor was done I gave it a final rinse and used the wet vacuum to remove as much moisture from the floor as possible before leaving it to fully dry off overnight. 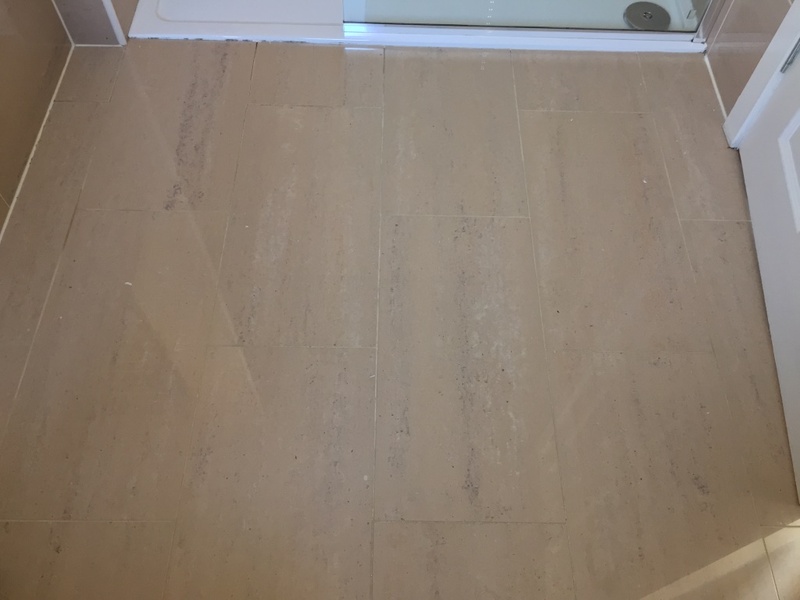 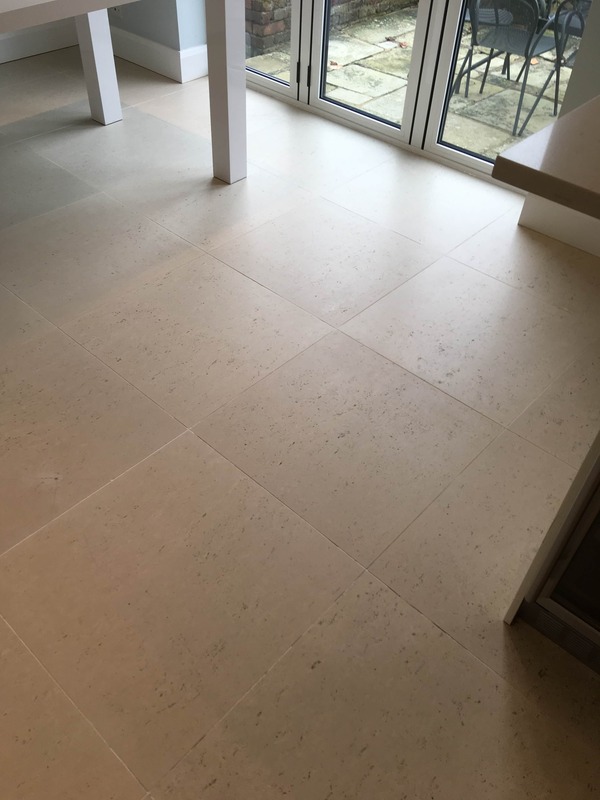 There are a number of different types of Porcelain tile and most do not require a sealer however I had determined that this type was in fact the micro porous variety and would accept a sealer. 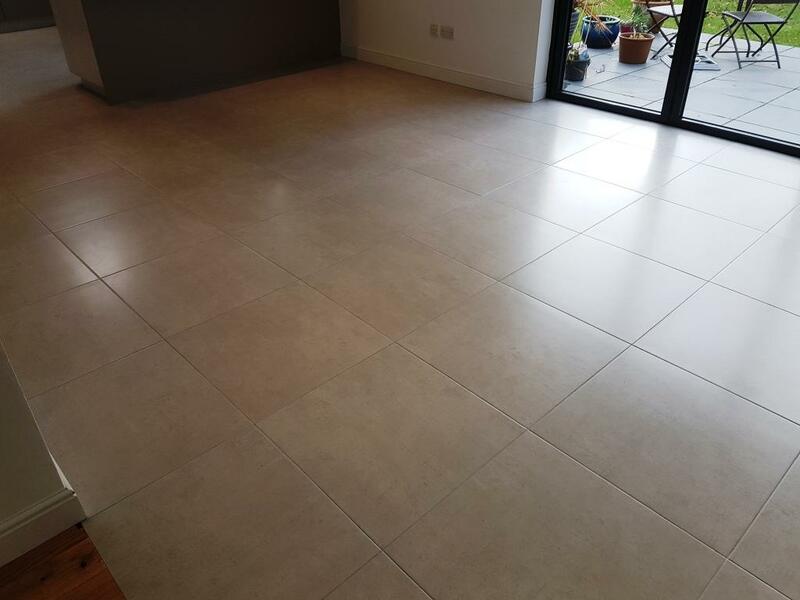 If you’re having a new tiled floor laid it helps to keep some unused tiles back so you can test different sealers on them before applying the sealer to the actual floor. 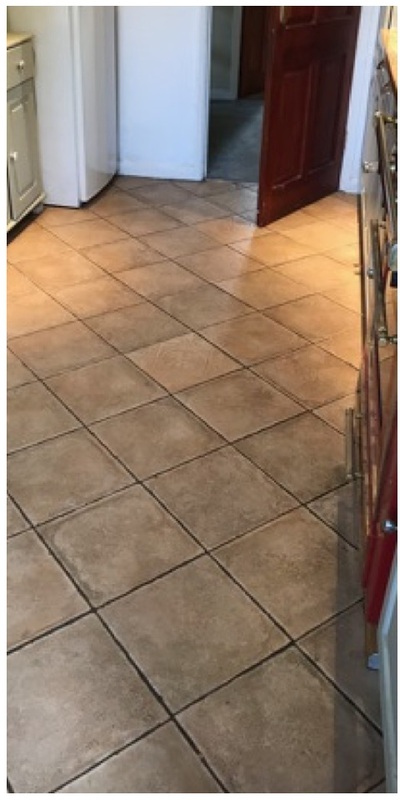 In this case three coats of Tile Doctor Seal and Go were applied and this worked very well as you can see from the photographs below. 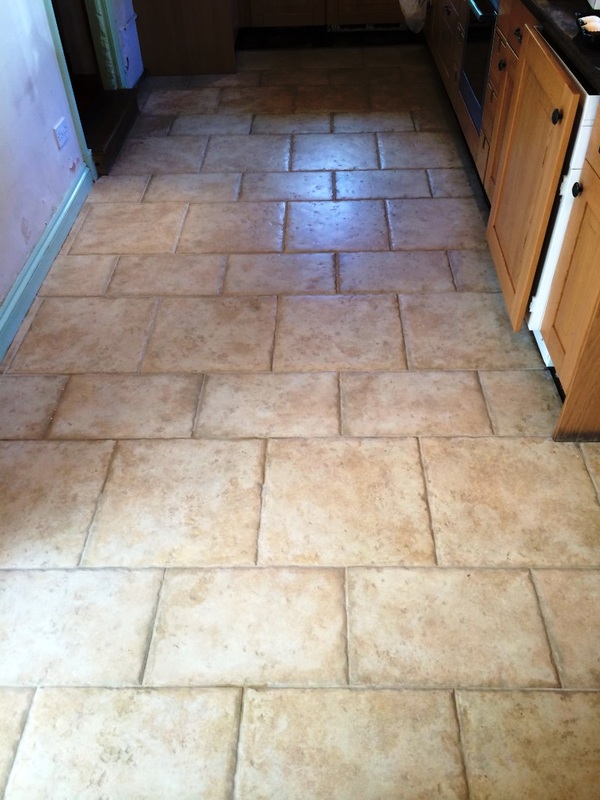 The customer said it looked better than it did when it was first laid so was very happy. 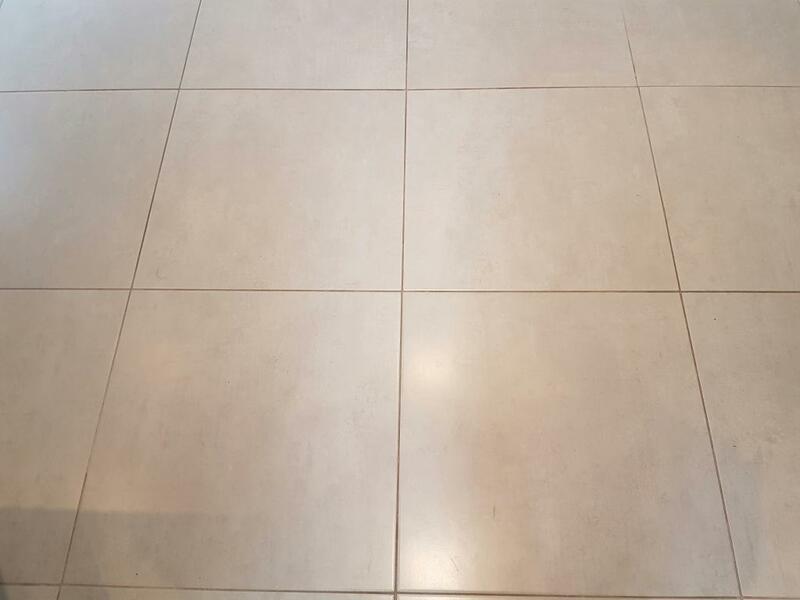 Grout is an incredibly important feature of tiled floors, not just from a structural perspective, but from an aesthetic perspective too. 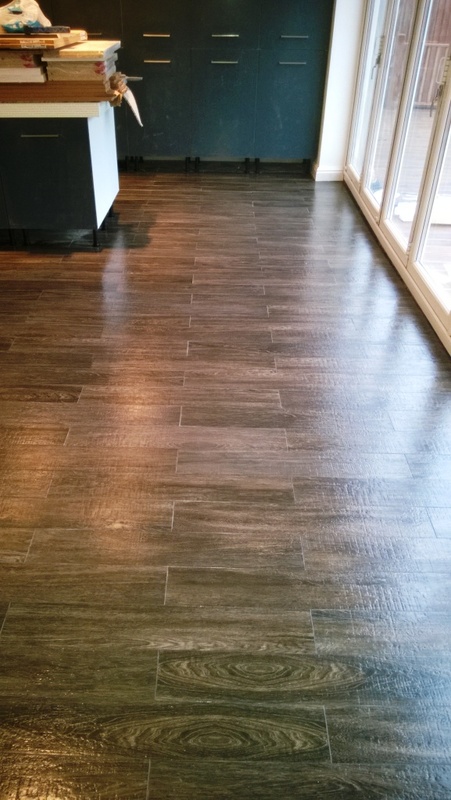 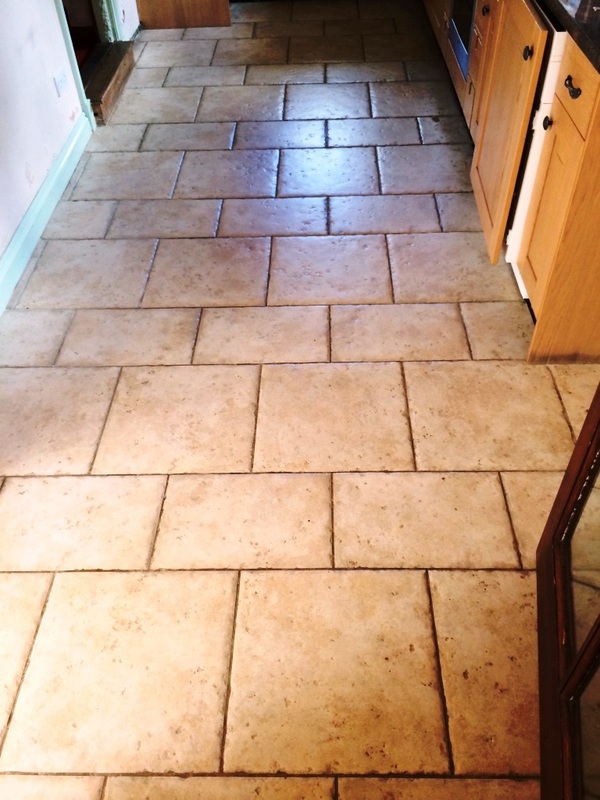 If the grout lines are dirty and stained, it ruins the overall look of the floor. 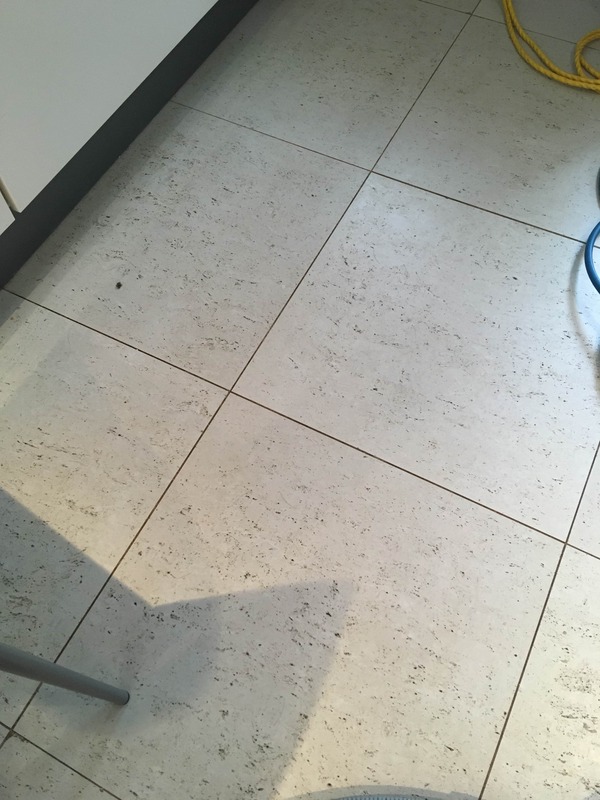 It’s important to try and keep them clean, but with grout being rough in nature it does attract dirt and if left un-checked it can easily get to the point where cleaning becomes very difficult. 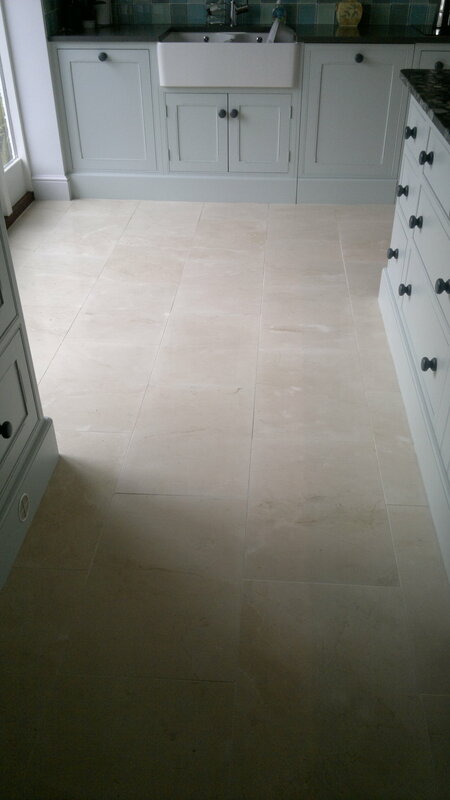 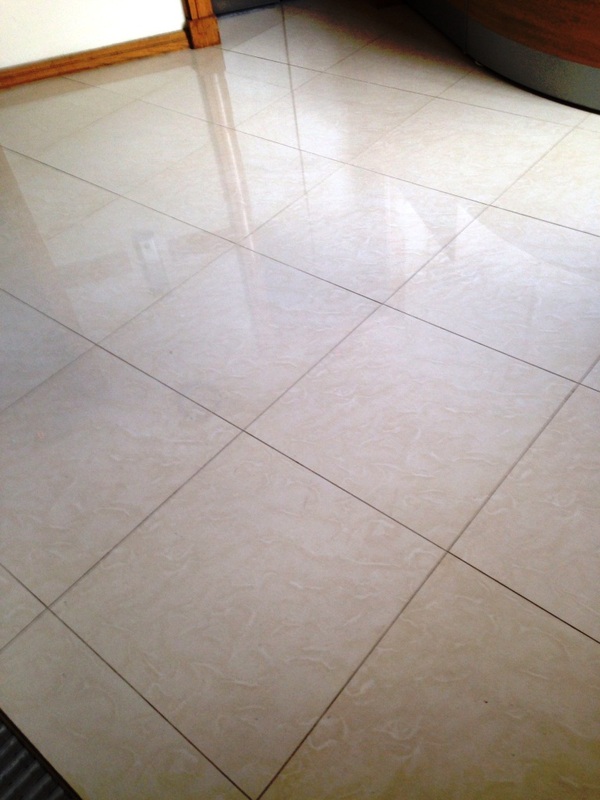 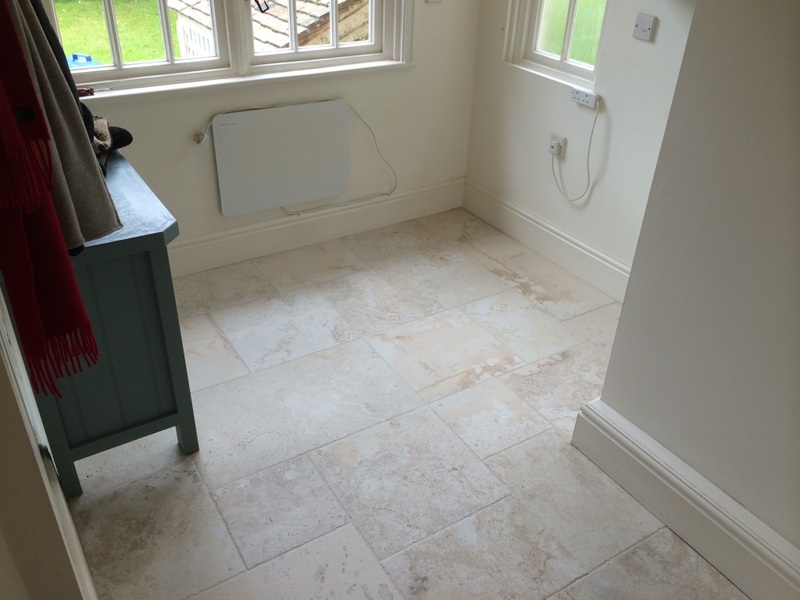 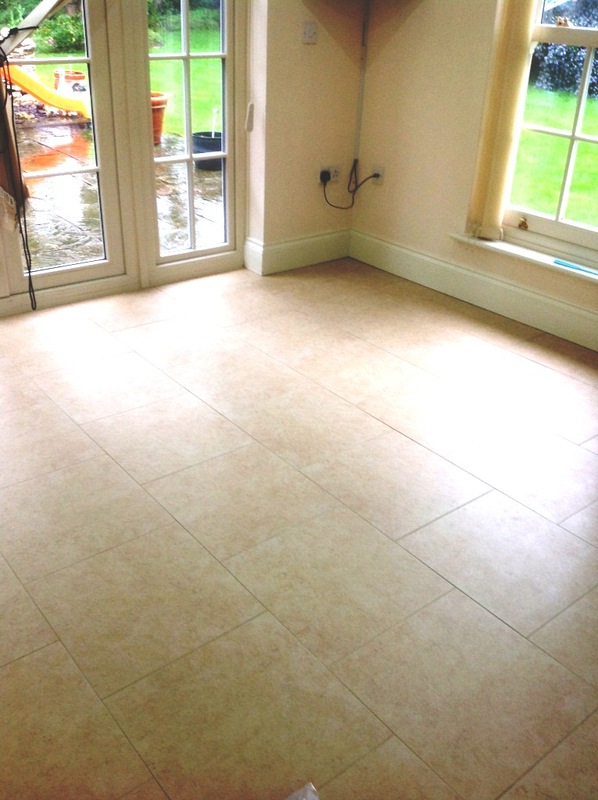 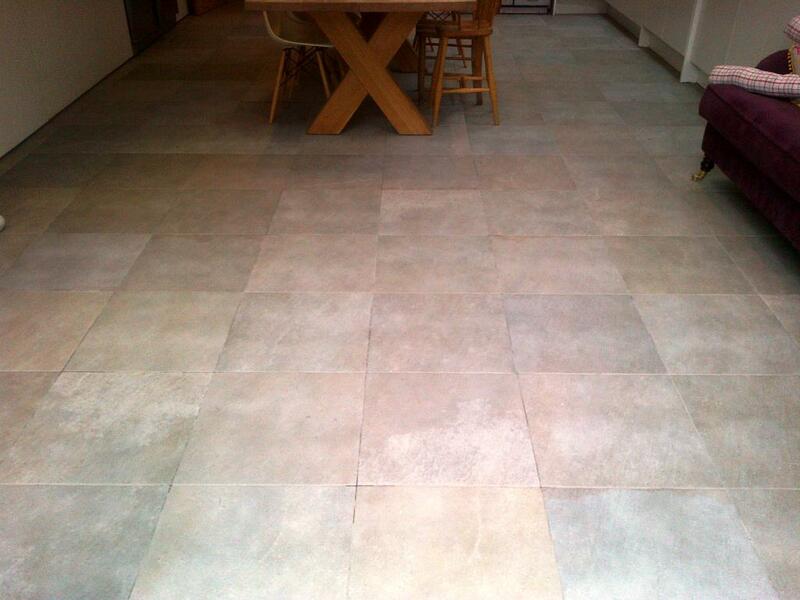 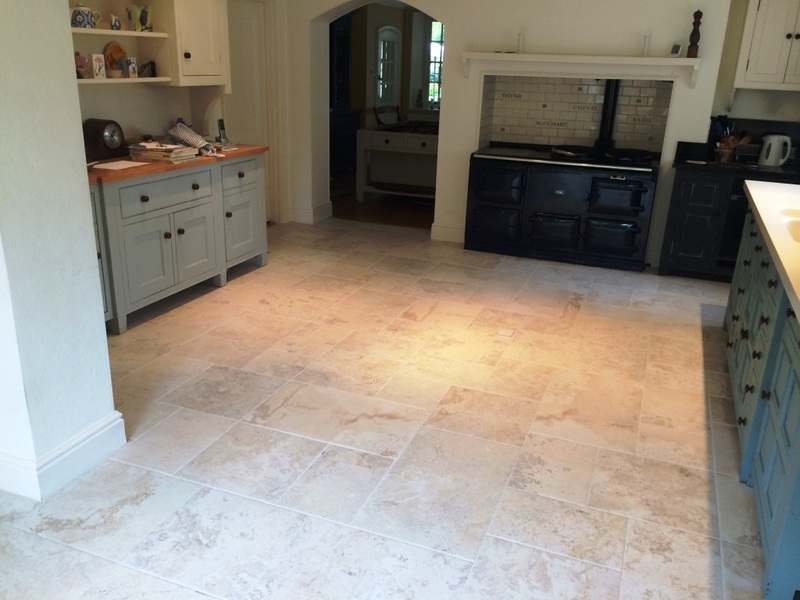 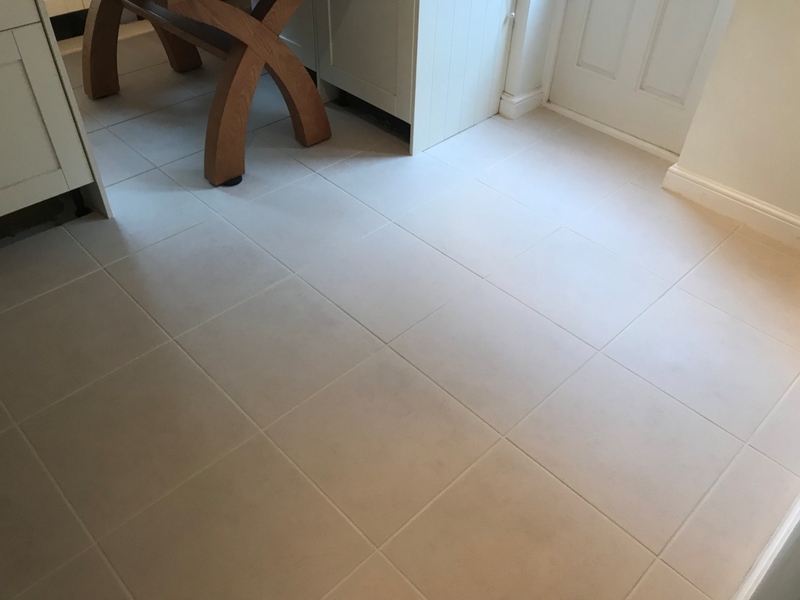 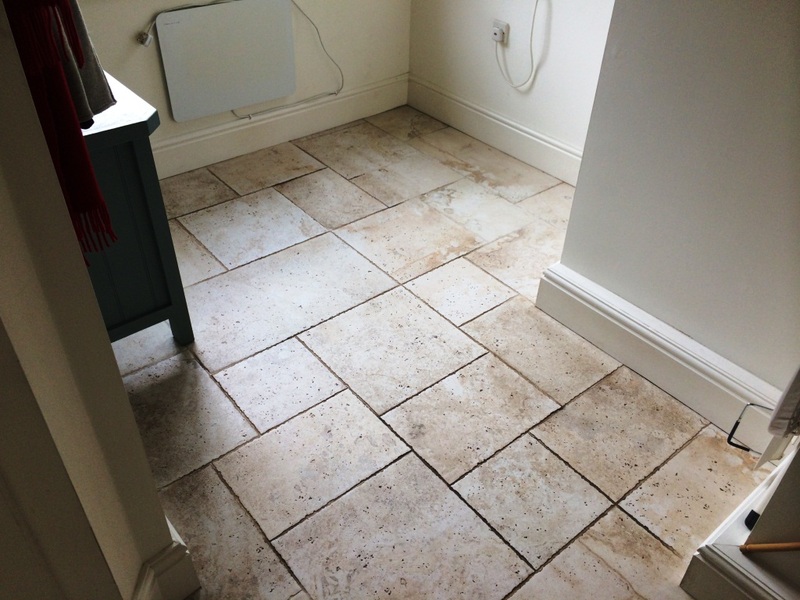 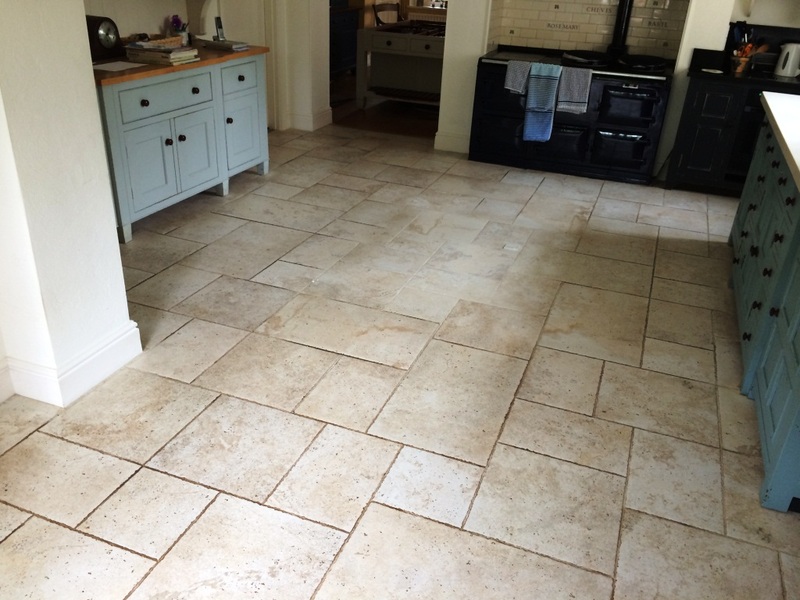 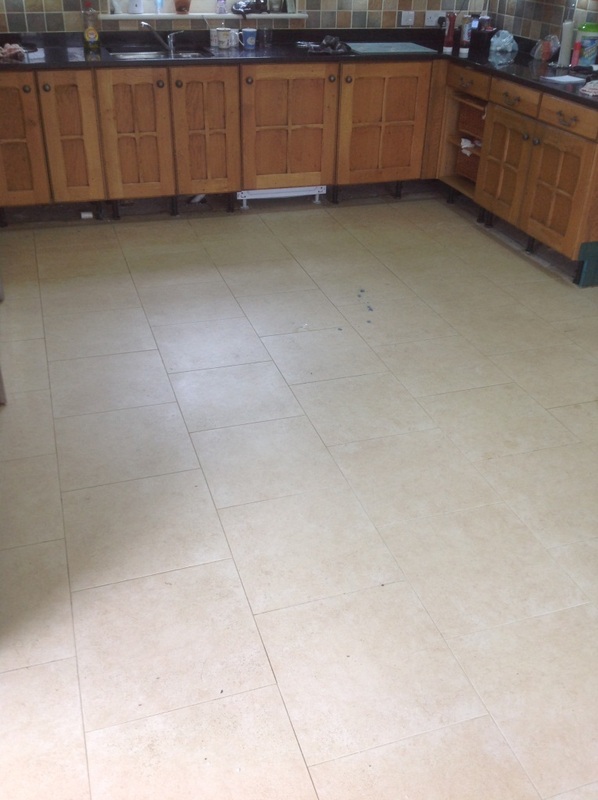 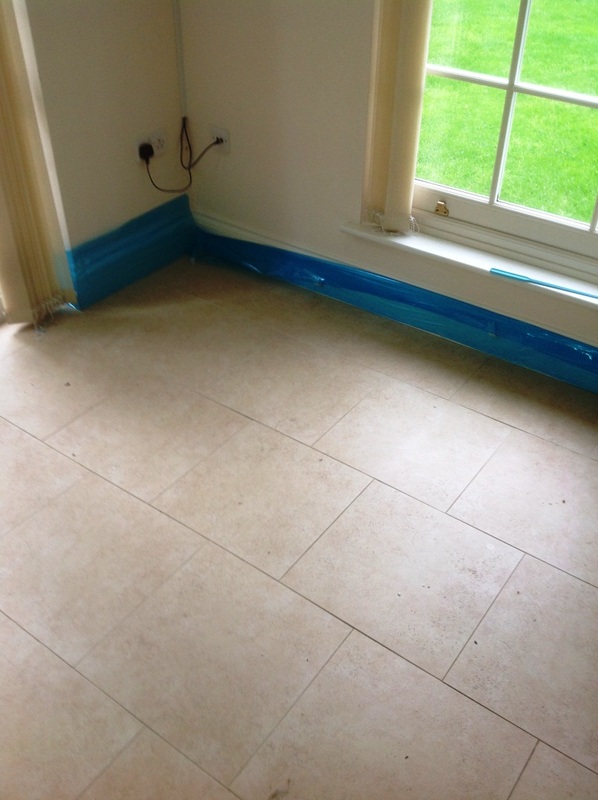 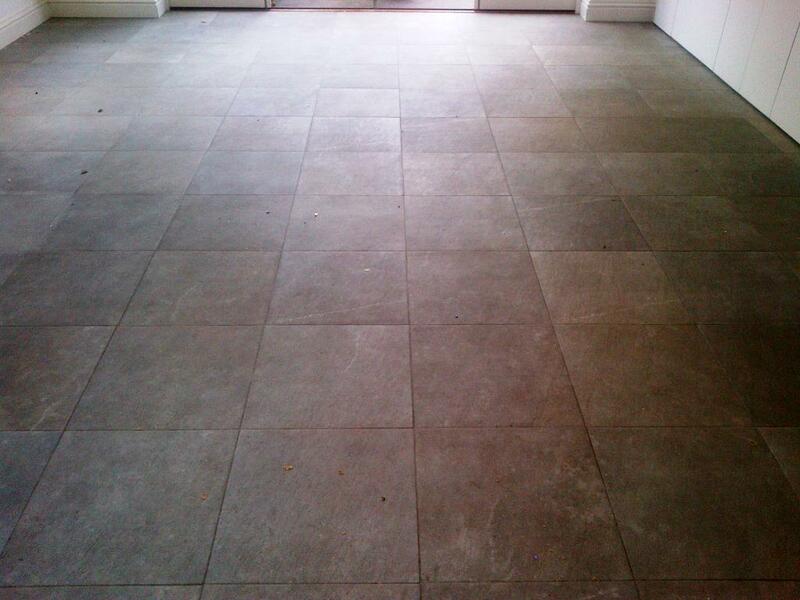 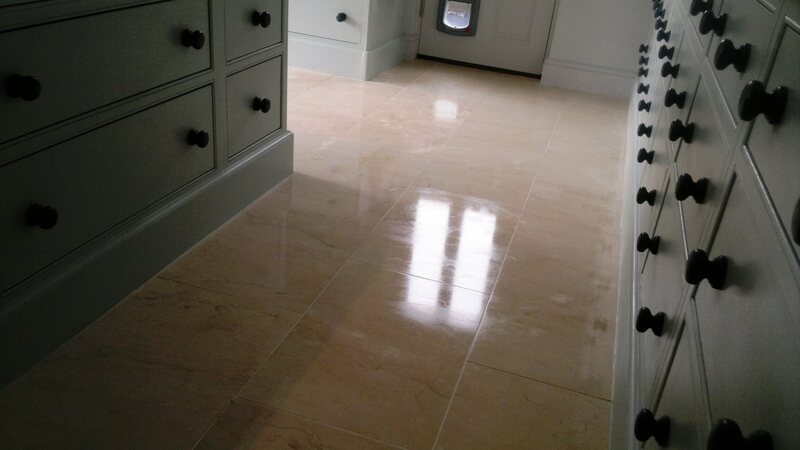 A good case in point was this Porcelain tiled kitchen floor at a property in the historic university town of Buckingham. 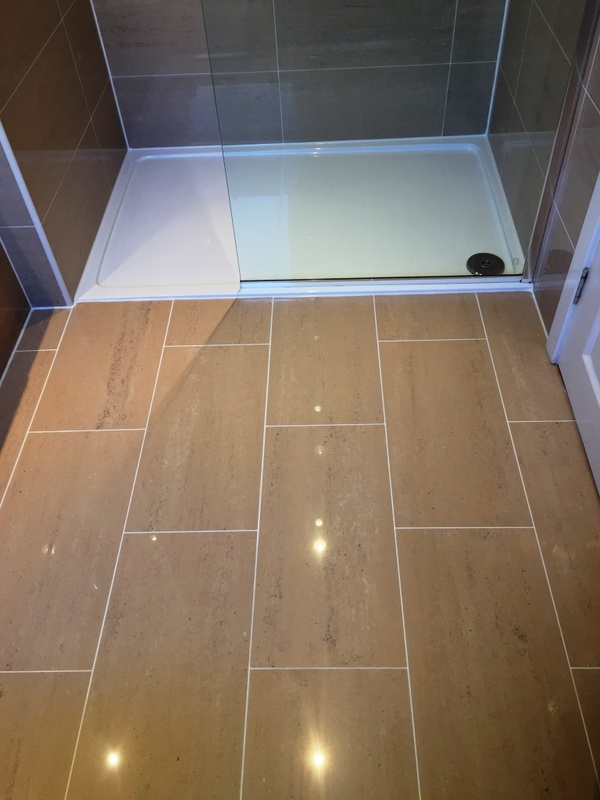 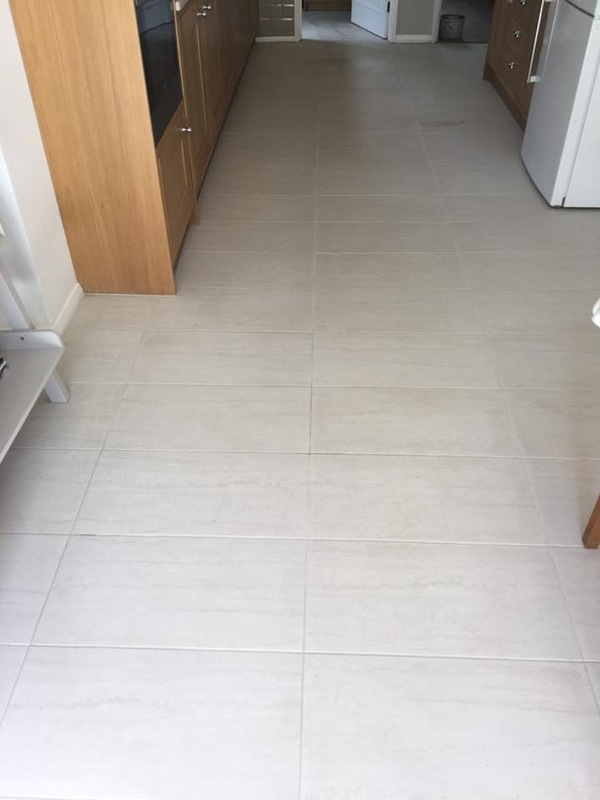 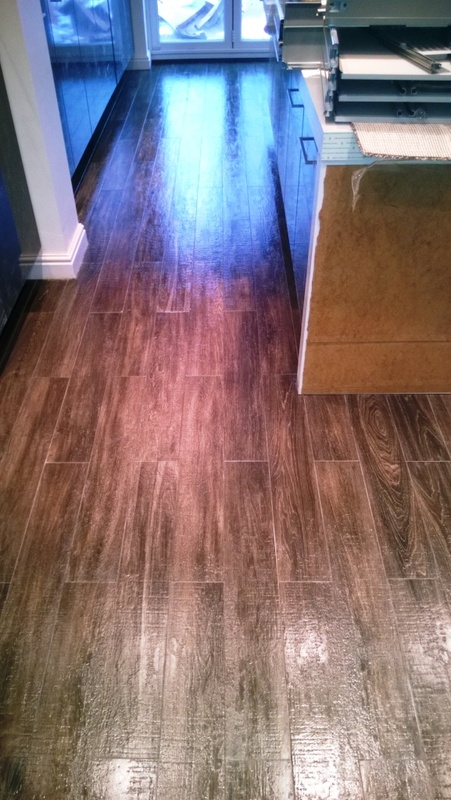 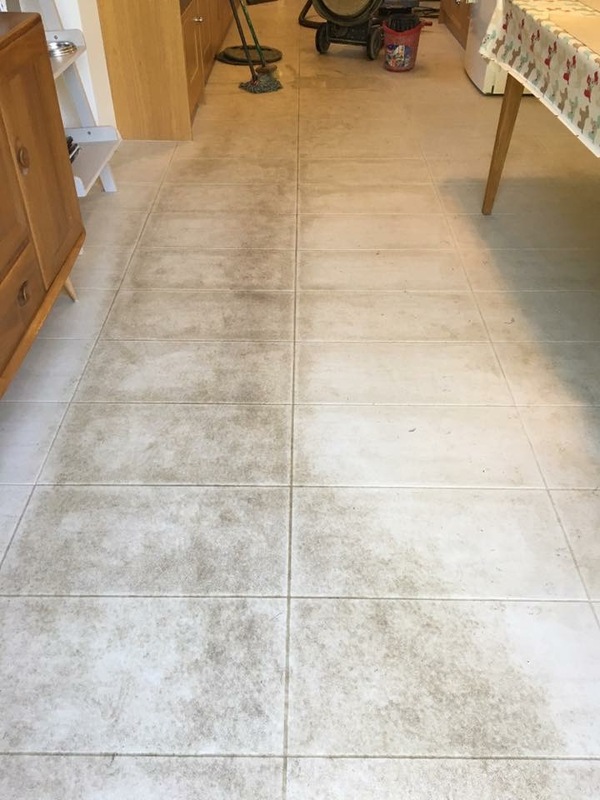 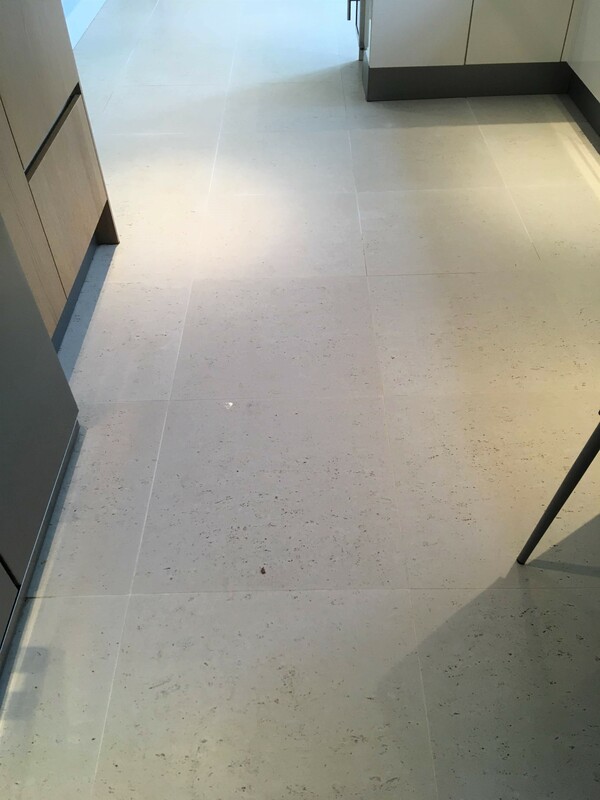 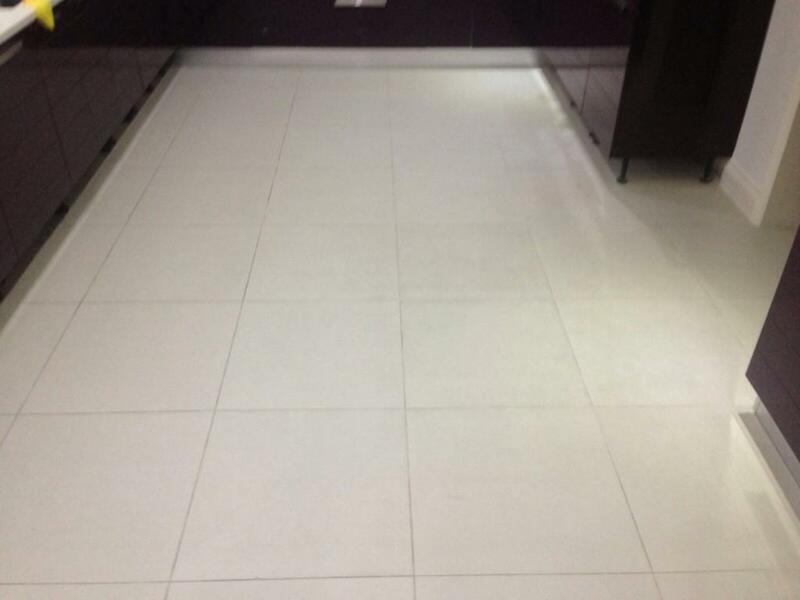 The floor had been installed approximately eight years prior and while during this time the property owner had made the best efforts to keep the tiles clean, the dirt and grime had begun to build up – particularly in the grout lines. 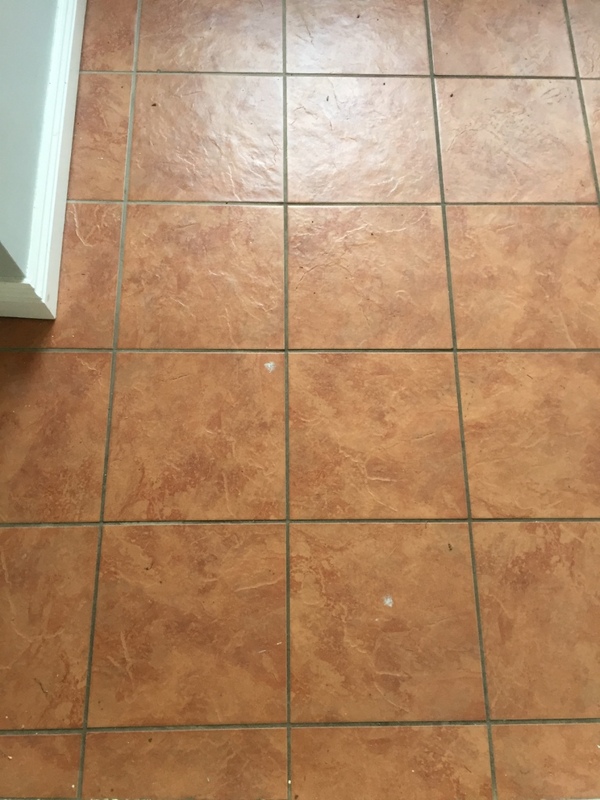 I visited the property to see what could be done, starting with an initial test clean with a strong solution of our high alkaline cleaner, Tile Doctor Pro Clean. 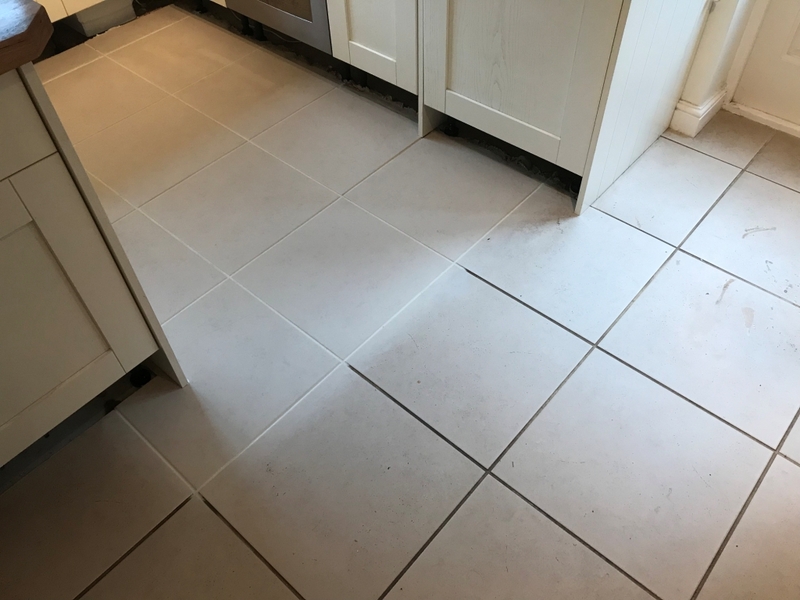 The tiles came up beautifully, but due to the extreme porosity of the grout, some of the dirt had been absorbed too deeply into the grout to get it completely clean. 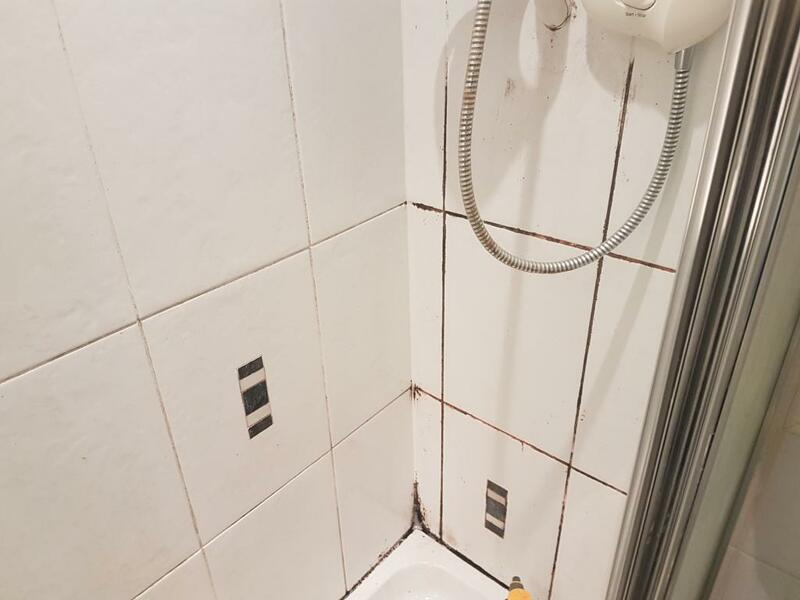 The customer was worried that this would mean ripping all the grout out and re-grouting, which is a messy and time consuming process. 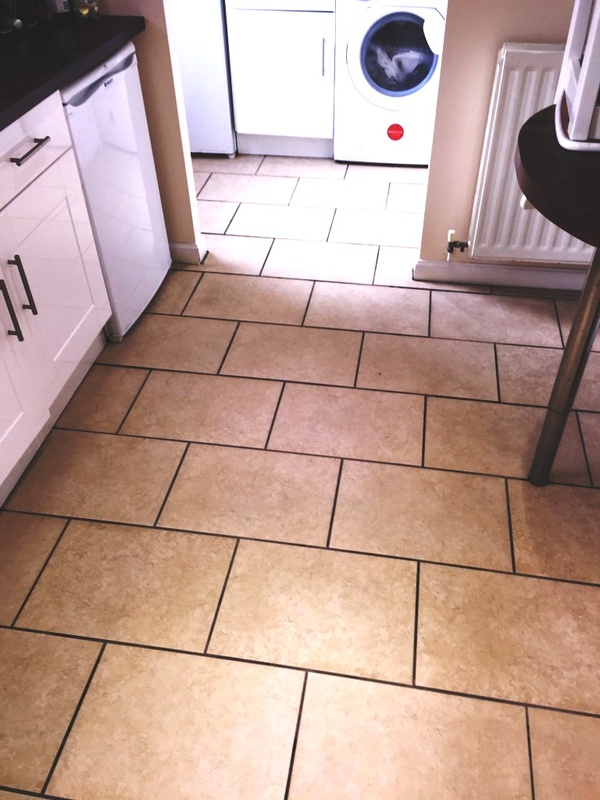 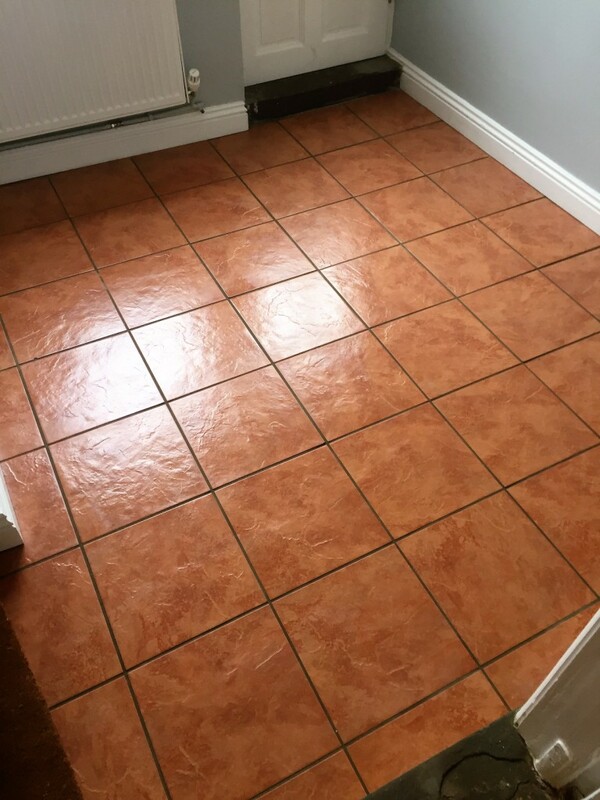 As an alternative, I advised him that recolouring the grout would be the better option, using one of the excellent grout colorants made by Tile Doctor which are available in ten popular colours. 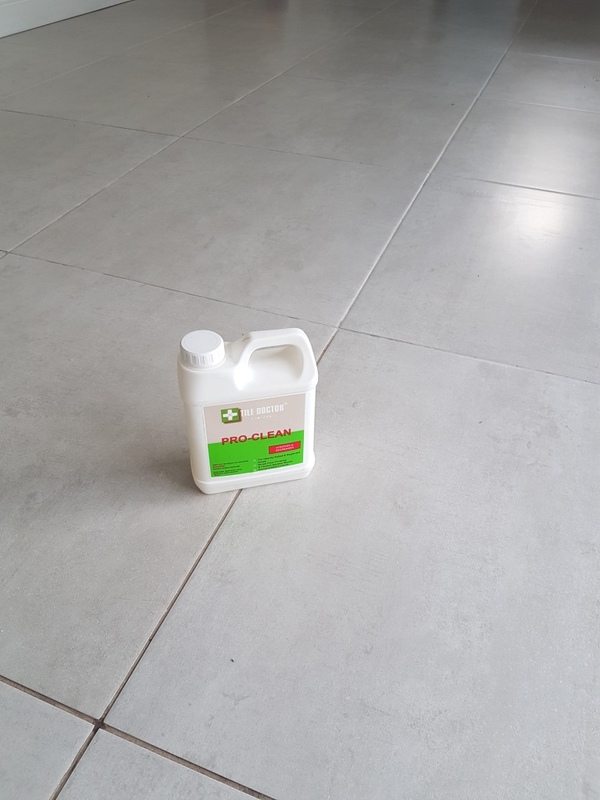 These products not only restore a clean and uniform appearance to the grout, they also provide a waterproof barrier which prevents any dirt and grime from penetrating the grout in the future. 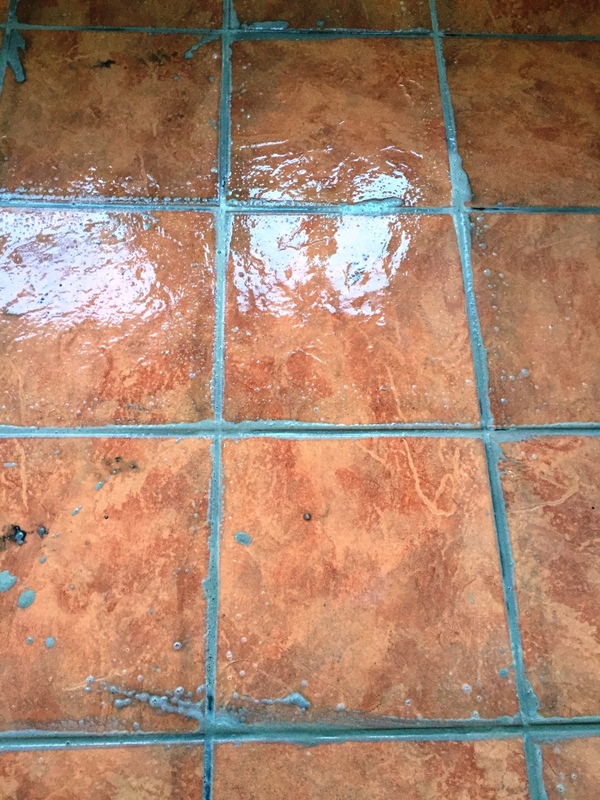 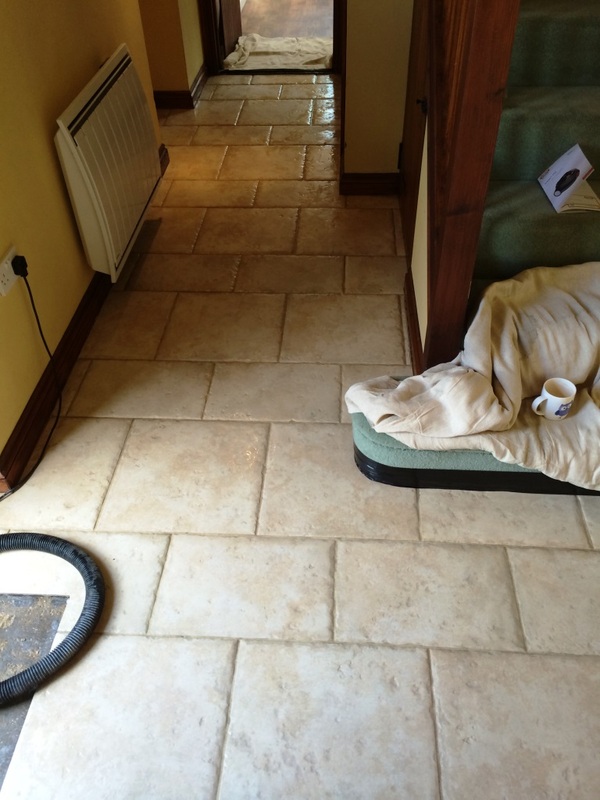 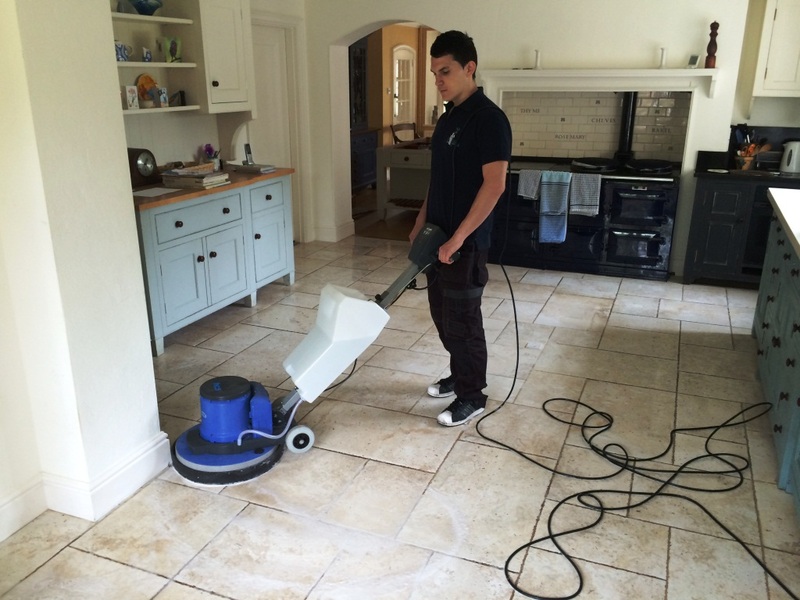 The recolouring process is a relatively quick, affordable, and a tidy alternative to re-grouting. 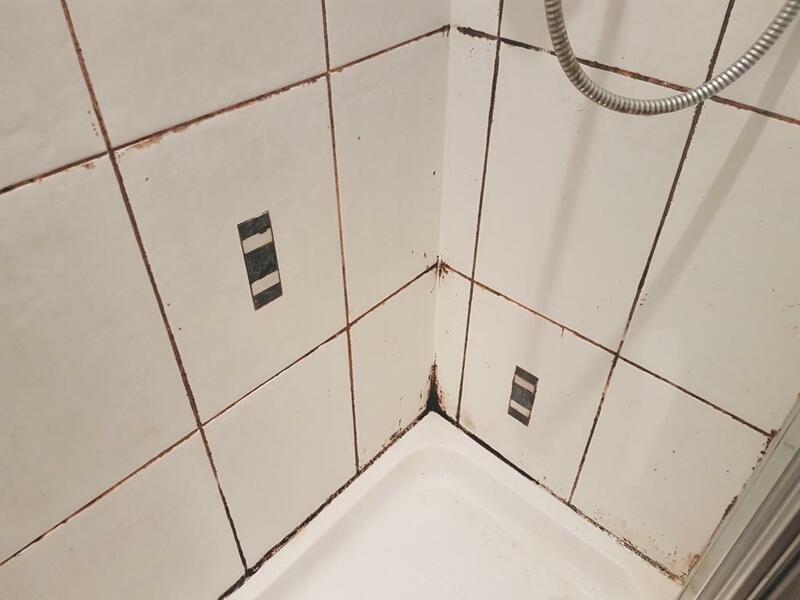 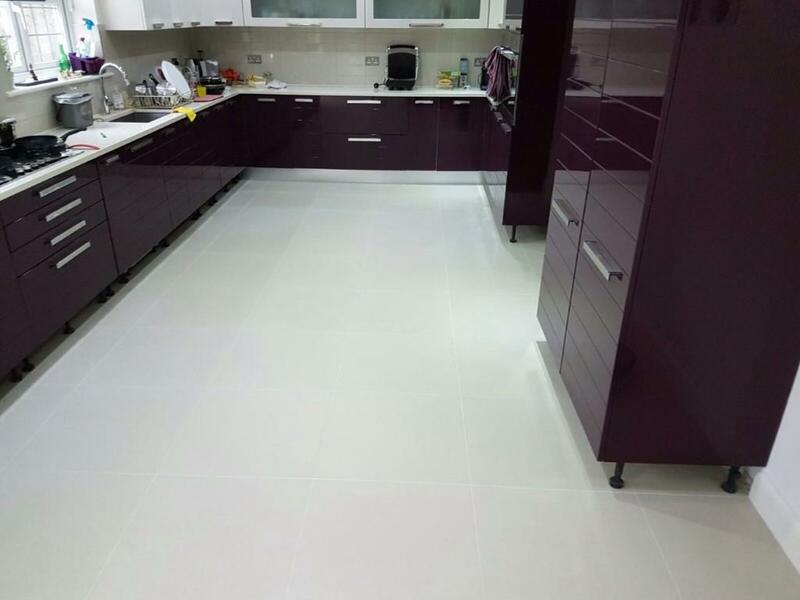 Impressed by the efficiency of the Pro Clean product and the cleanliness of the test patch, the customer requested that we go ahead and deep clean the tiles and re-colour the grout. 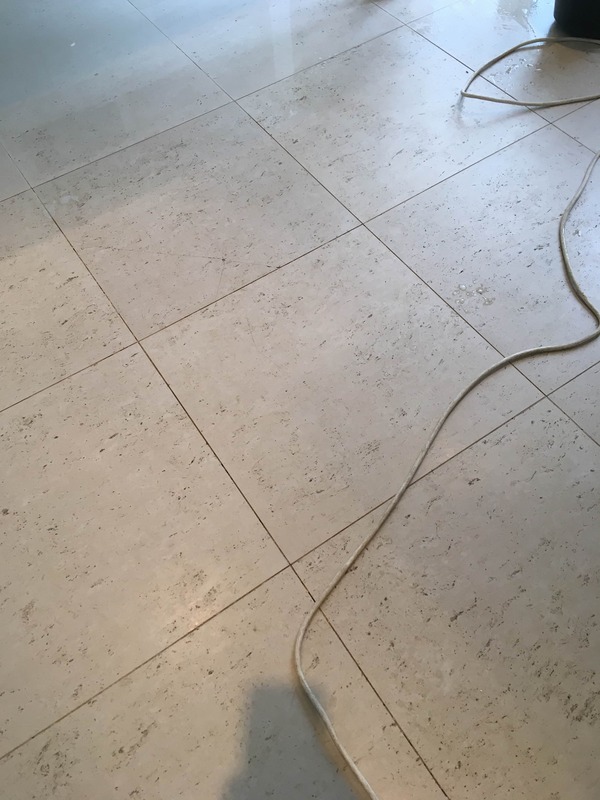 The work took two days. 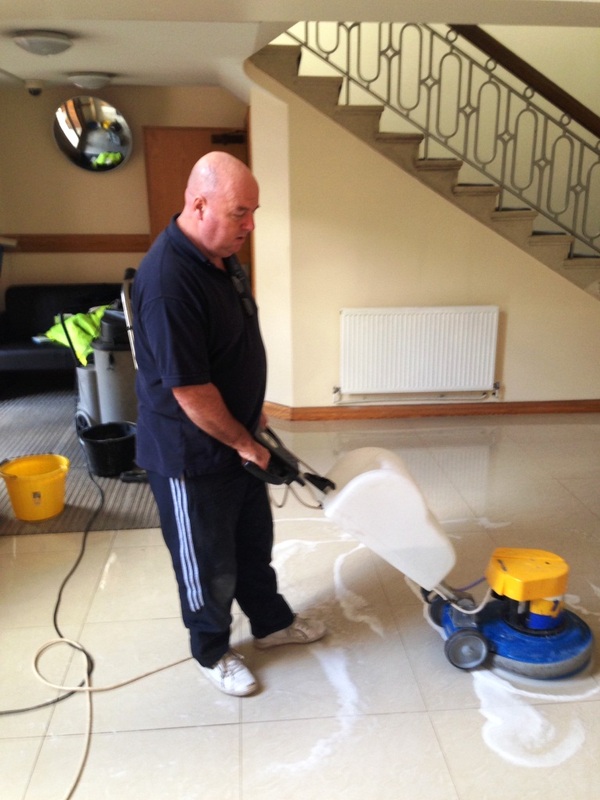 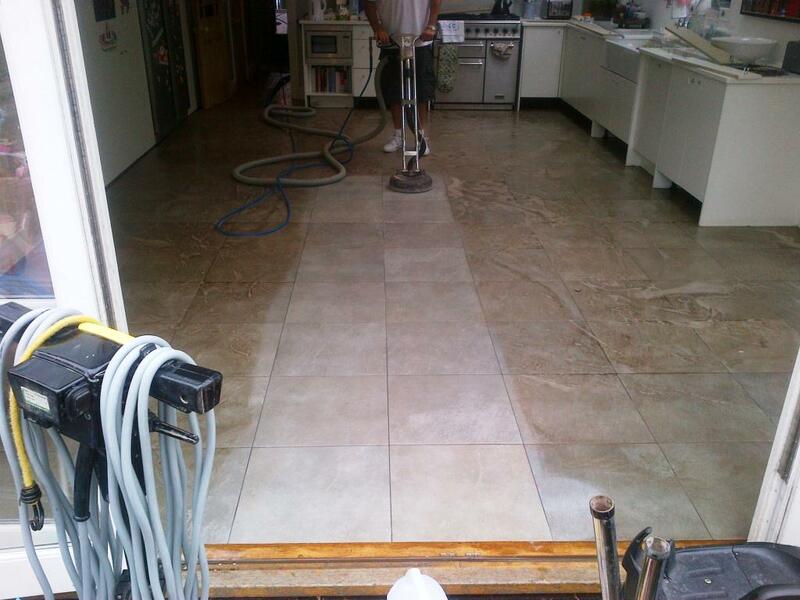 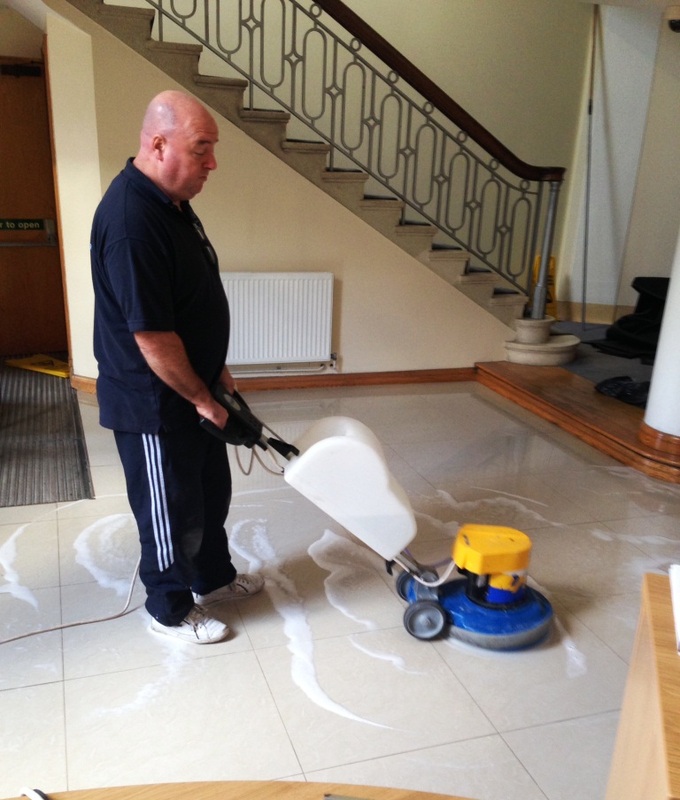 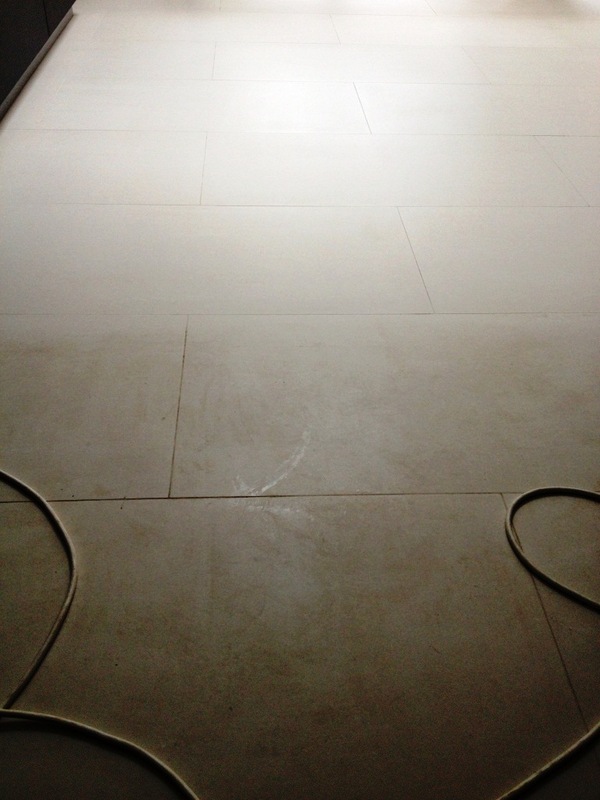 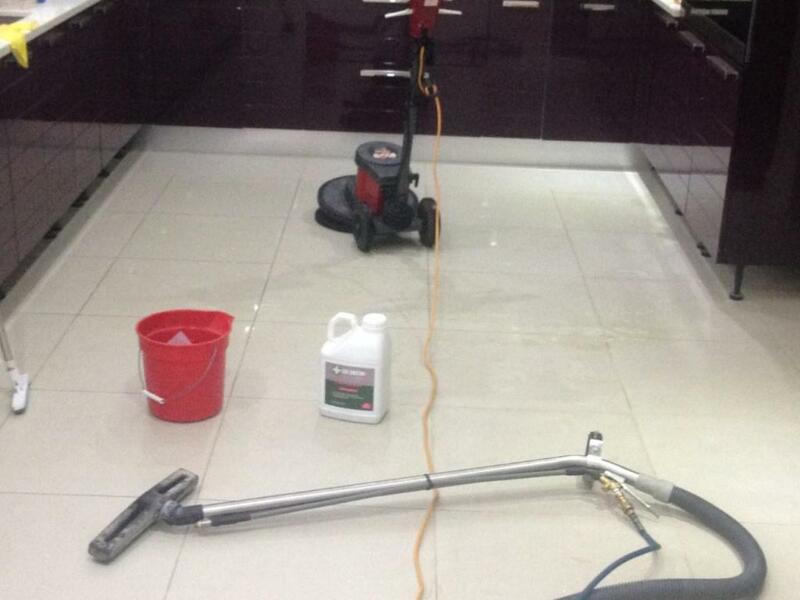 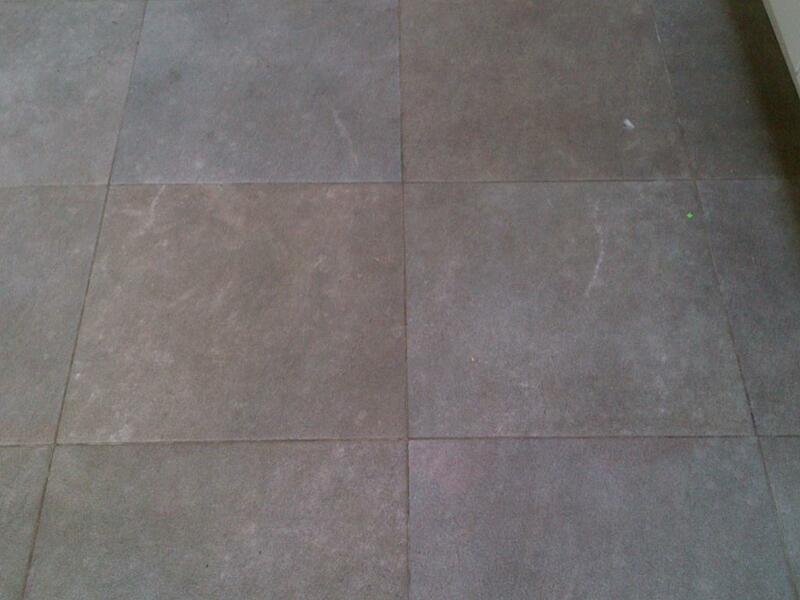 On the first day, we deep cleaned all the tiles and grout using the same strong solution of Pro-Clean. 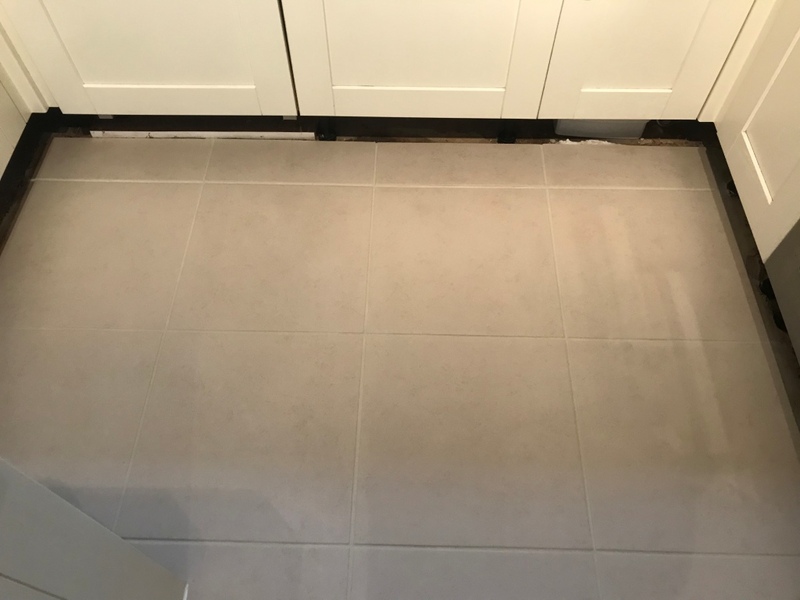 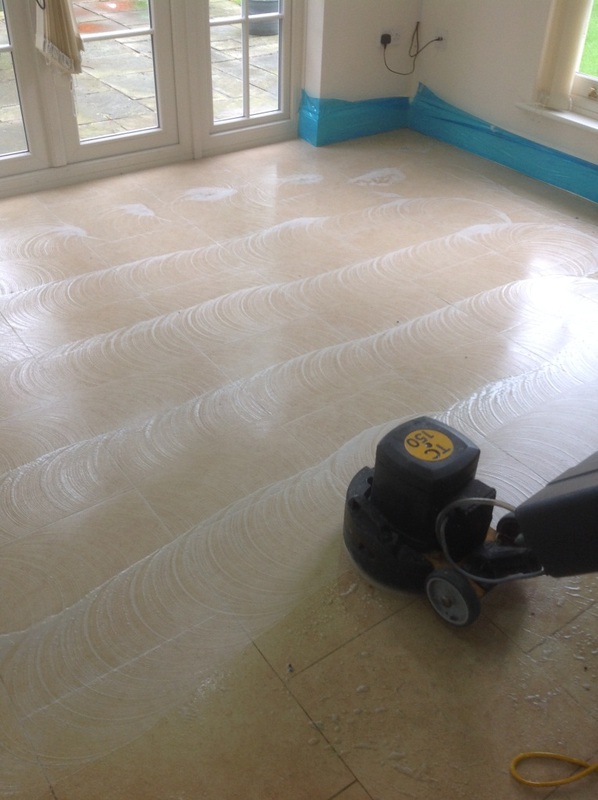 The solution was applied to the floor and left to dwell for approximately ten minutes and from there I used a rotary machine fitted with a black scrubbing pad to loosen the soil from the tiles. 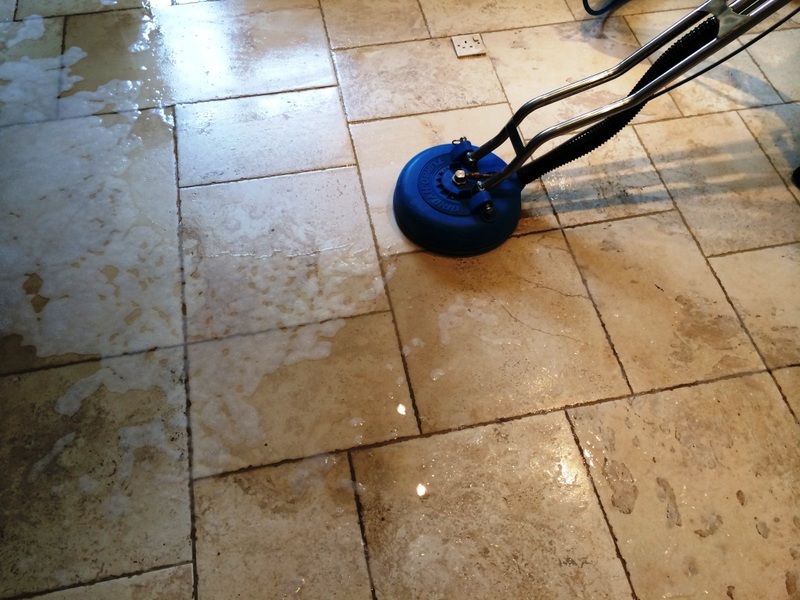 Once the floor had been thoroughly scrubbed, I used our wet pick up and rinsing machine to remove all the dirty water, and rinse the floor with clean water. 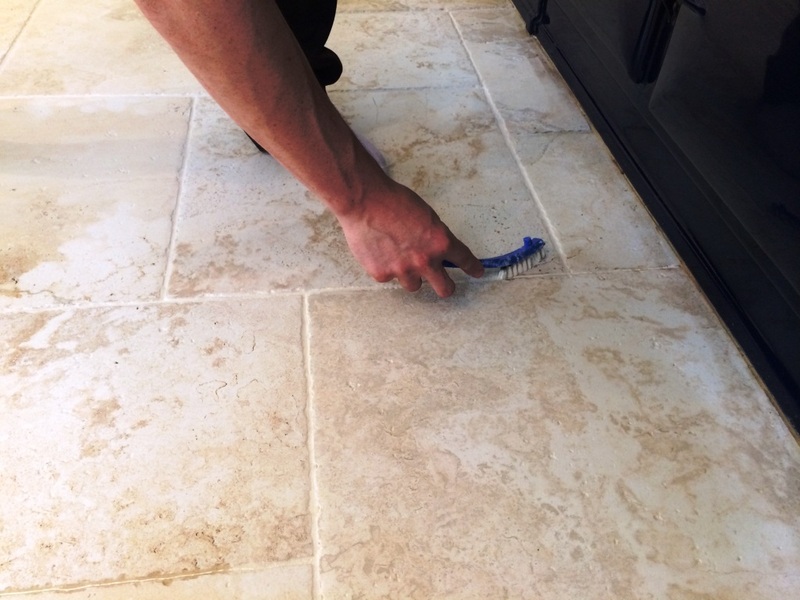 Next we moved on to cleaning the grout. 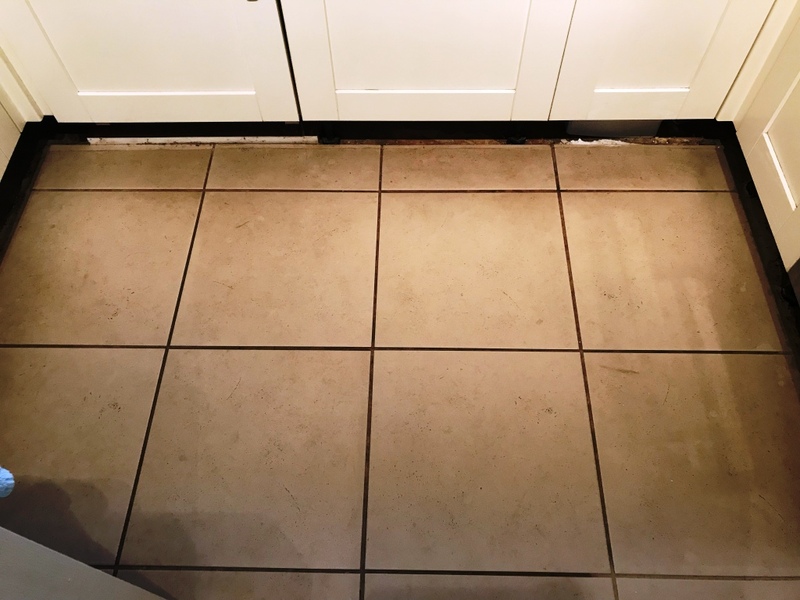 I started by applying Tile Doctor Pre-Treatment Cleaner and left it for approximately 15 minutes before scrubbing it in by hand using a stiff grout brush. 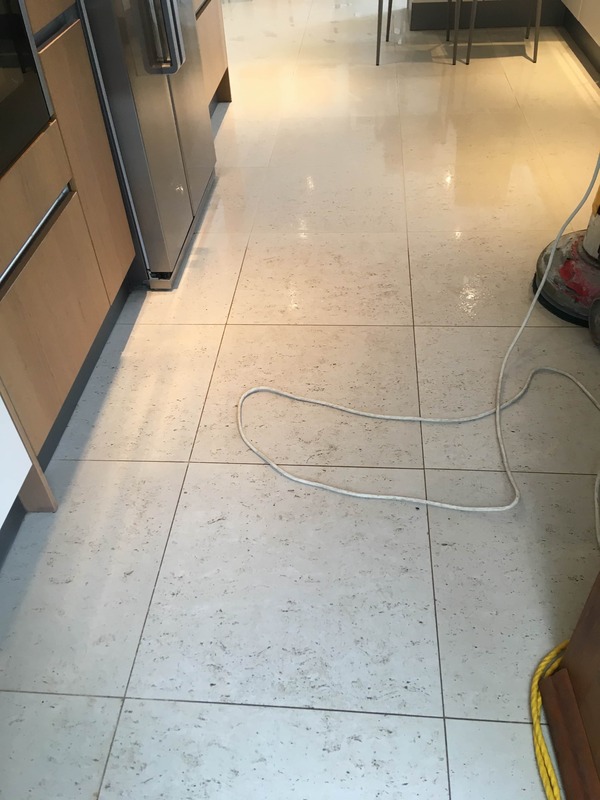 This process serves two purposes: firstly, it helps to remove as much dirt as possible from the grout lines prior to re-colouring and secondly, the acidity in the product etches the grout slightly, helping to make a better bond with the Grout Colourant. 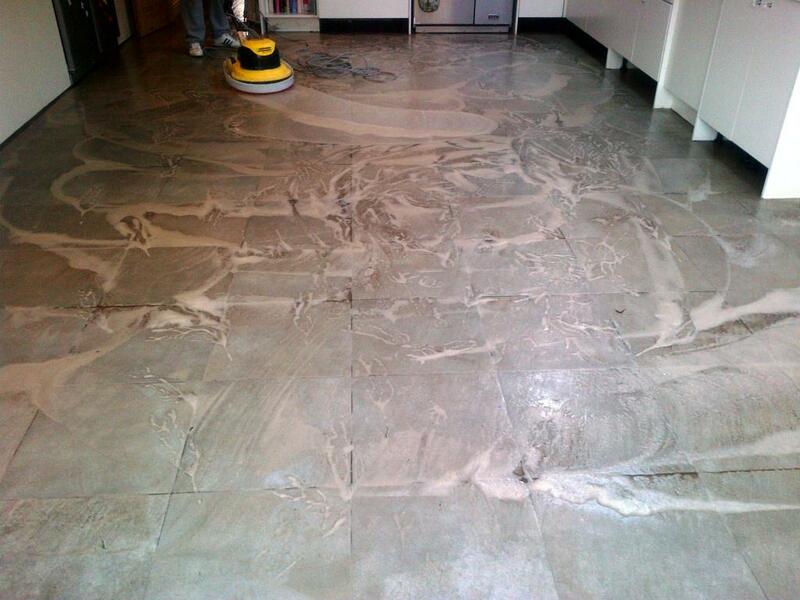 Once the process was complete, I rinsed and dried the floor one more time and left it to dry off overnight. 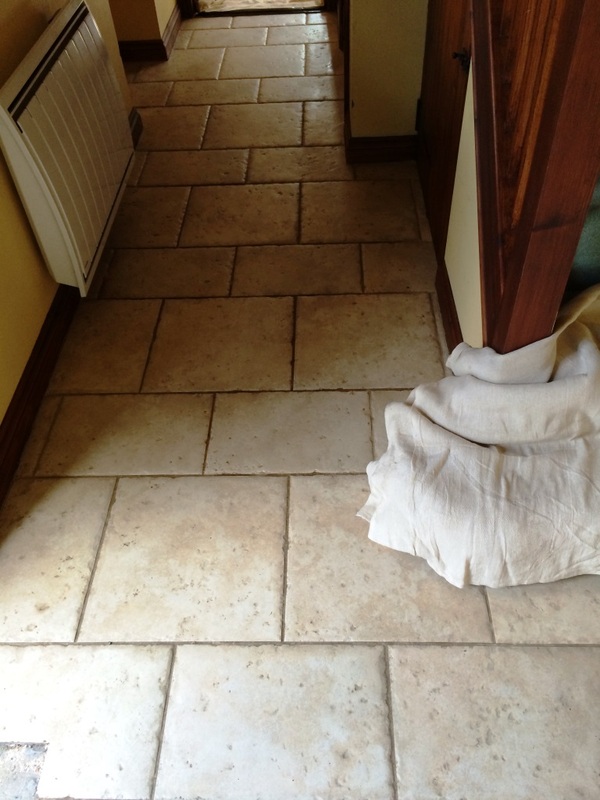 The next morning, I returned to colour and seal the grout with an Ivory Grout Colourant as selected by the customer. 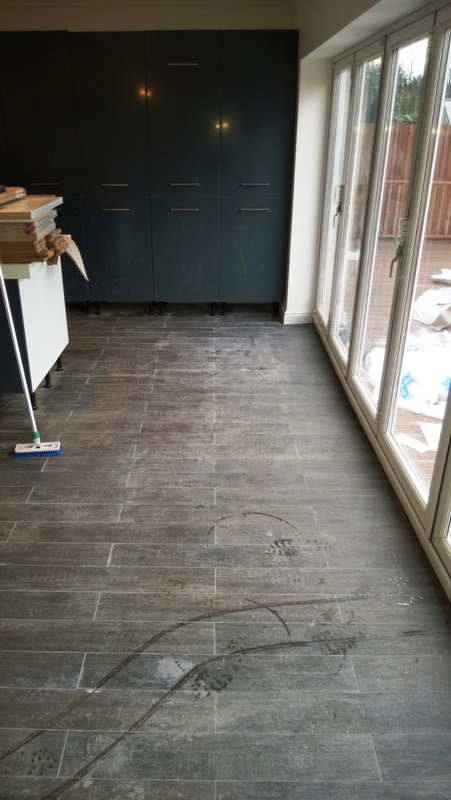 The process is quite straight forward and involves using a small brush to carefully apply the colorant along each grout line. 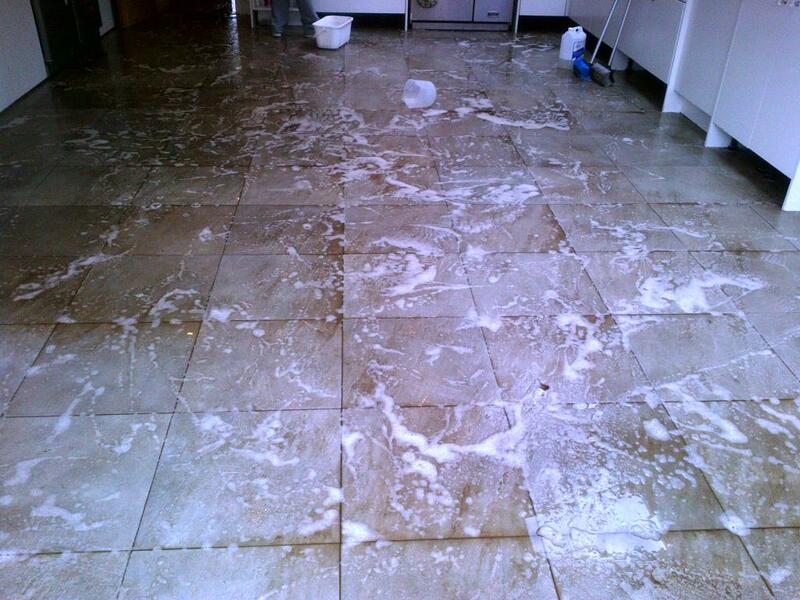 When I was finished, I made sure to clean any excess product off the tiles before it had time to dry. 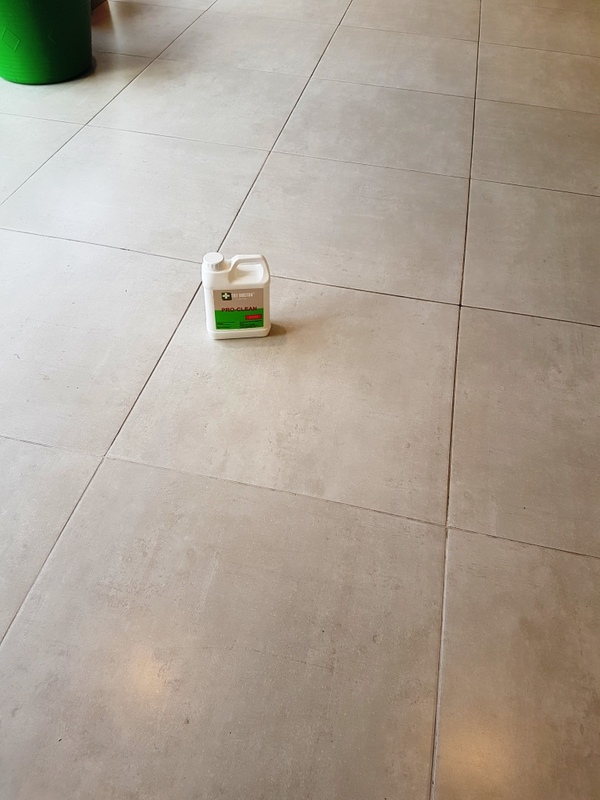 Finally, I buffed the floor with a fine white buffing pad, leaving the tiles looking clean and fresh, with the grout uniform. 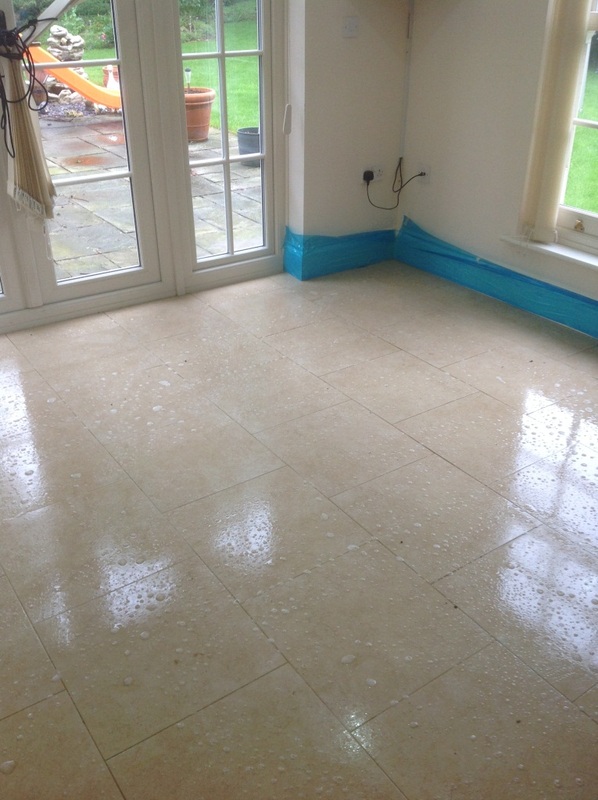 The customer was absolutely delighted with the service and the results.